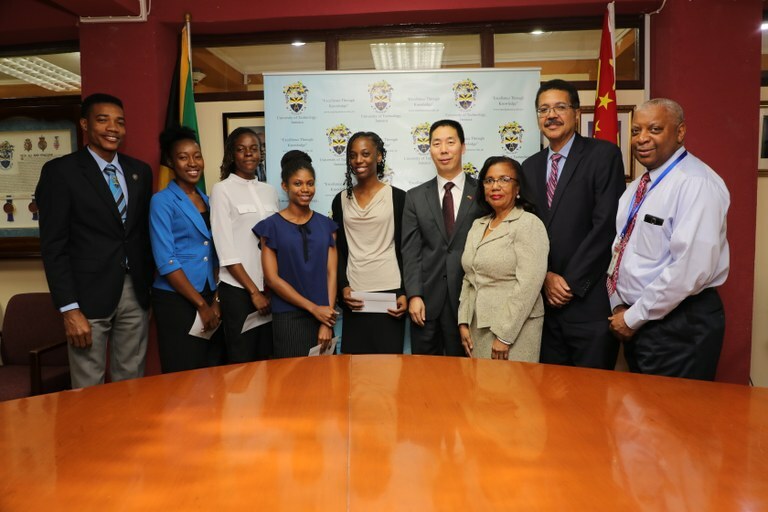 Five UTech, Jamaica Students Receive Scholarships from China’s Ambassador to Jamaica — UTech, Ja. Chinese Ambassador to Jamaica His Excellency Niu Qingbao (4th right) poses with UTech, Jamaica students who were awarded the Chinese Embassy scholarship for the 2017/18 Academic Year at a special presentation ceremony at the University’s Papine campus on Tuesday, January 30, 2018. Sharing in the occasion (from left) are Mr. Granville Knight, UTech, Jamaica Students’ Union President, Scholarship recipients Miss Rasneash Matthews, Miss Toni-Ann Walters, Miss Deriann Smith and Miss Afasha Foster, UTech, Ja. administrators, Mercedes Deane, University Registrar, Prof. Stephen Vasciannie, CD, President and Prof. Paul Golding, Dean, College of Business and Management. Five University of Technology, Jamaica students on Tuesday, January 30, 2018 were presented with the Chinese Ambassador’s Scholarship by His Excellency Niu Qingbao, Ambassador of the People’s Republic of China to Jamaica at an awards presentation ceremony held at the University’s Papine Campus. The scholarships funded by the Chinese Embassy in Jamaica valued at $1M, will assist students with tuition fees for the 2017/18 Academic Year. The scholarship awardees are Miss Rasneash Matthews, third year student, Bachelor of Arts in Communication Arts Technology, Faculty of Education and Liberal Studies, Miss Deriann Smith, first year Dental Hygiene Student, College of Oral Health Sciences, Miss Toni-Ann Walters, first year student, School of Computing and Information Technology and fourth year students Miss Afasha Foster, Accounting major, College of Business and Management and Mr Camrie Hines, Environmental Health student, School of Public Health and Health Technology (who was absent from the presentation ceremony). His Excellency Niu Qingbao in his remarks congratulated the recipients on their selection, and expressed confidence that they all represent Jamaica’s “bright future.” Ambassador Qingbao shared that in recent years, bilateral friendship and pragmatic cooperation between Jamaica and China have “expanded rapidly based on firm mutual respect.” He added that he is happy that his government is now able to share its resources with “our friends in Jamaica.” In recent years the government of China has offered scholarships to Jamaican students to complete studies at tertiary institutions at home or at universities in China. Ambassador Qingbao encouraged the young students to make good use of the opportunity that will “help to cover your parents’ financial burden even though it may not be able to cover all your tuition fees.” He further encouraged the students to prepare themselves to contribute to the transformation of Jamaica’s economy in areas such as agricultural technology, manufacturing and in ICT. Twenty one UTech, Jamaica students have been beneficiaries of the Chinese Embassy Scholarship over the past four years.